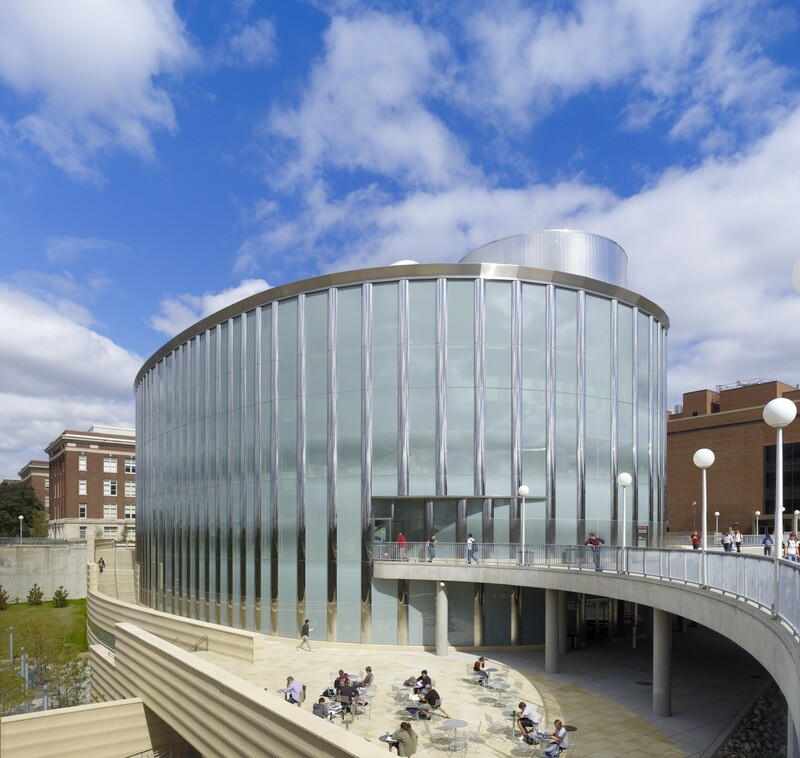 HGA partnered with Kohn Pedersen Fox on this 115,000-SF academic building that transforms teaching and learning. 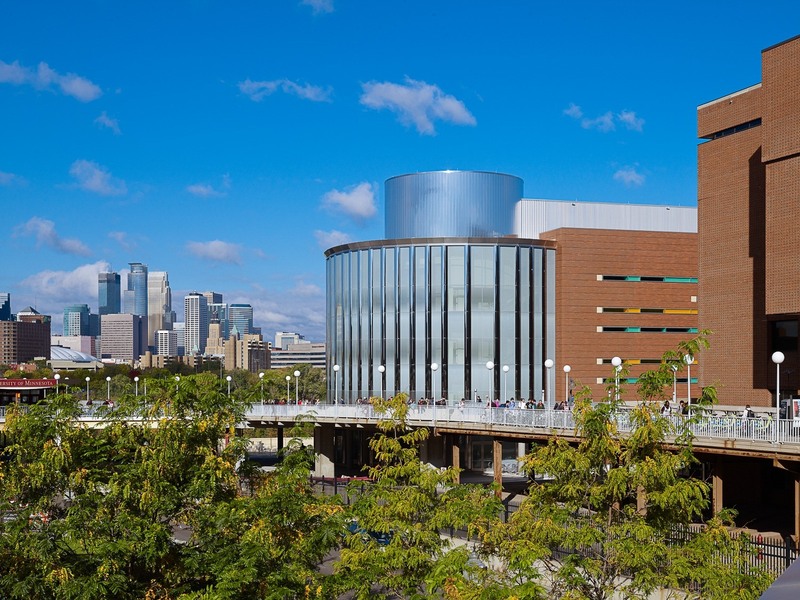 Located at the foot of Washington Avenue pedestrian bridge connecting the Campus Mall with the West Bank campus, the building overlooks the Mississippi River and downtown Minneapolis skyline. The architecture facilitates pedestrian flow through the building while visually engaging the Mississippi River valley through a sweeping glass wall with energy-efficient glazing. 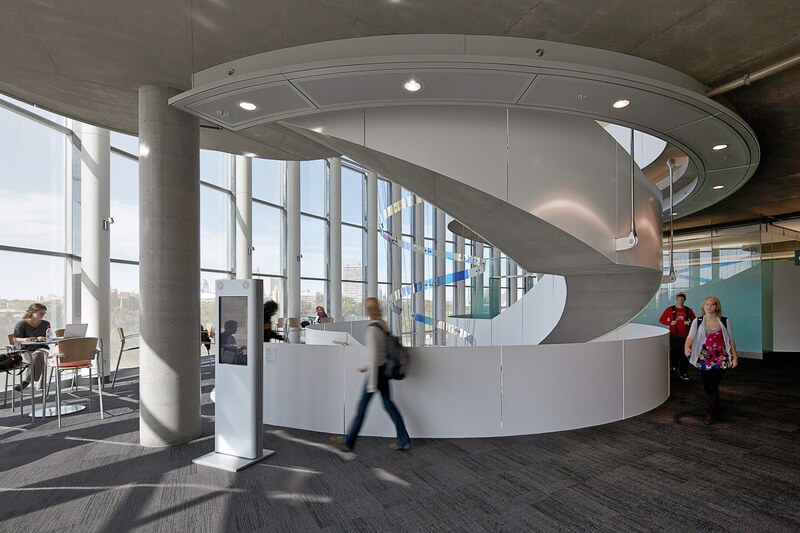 Inside, a centrally-located spiral staircase connects to different levels, where Active Learning Classrooms foster interactive student-centered learning. Serving dual purposes of classroom and student services (such as academic advising, career counseling, and registration), the building establishes a new campus landmark. Because this building serves as a classroom and student service center, HGA designed the infrastructure to efficiently handle heavy traffic flow through the building and around the site. The electrical infrastructure supports this new paradigm in classroom education, in which Wi-Fi zones, smartboards and new technology engage students throughout the building. The STSS building redefines the University’s southwest entrance with a welcoming network of arced paths and stairs along a 50-foot riverfront grade. Collectively, these pedestrian landscape elements—which address the river and the architecture—provide a sense of place within the larger campus. The building’s mechanical engineering system incorporates under-floor air distribution, natural daylighting, total energy recovery, individual temperature controls, and high-efficiency lighting systems, including LED for long-term sustainable results. The Center integrates with the University’s district energy central steam plant and central chilled water plant to exceed ASHRAE 90.1 2004 energy requirements by 25 percent. LEED® Gold certified. 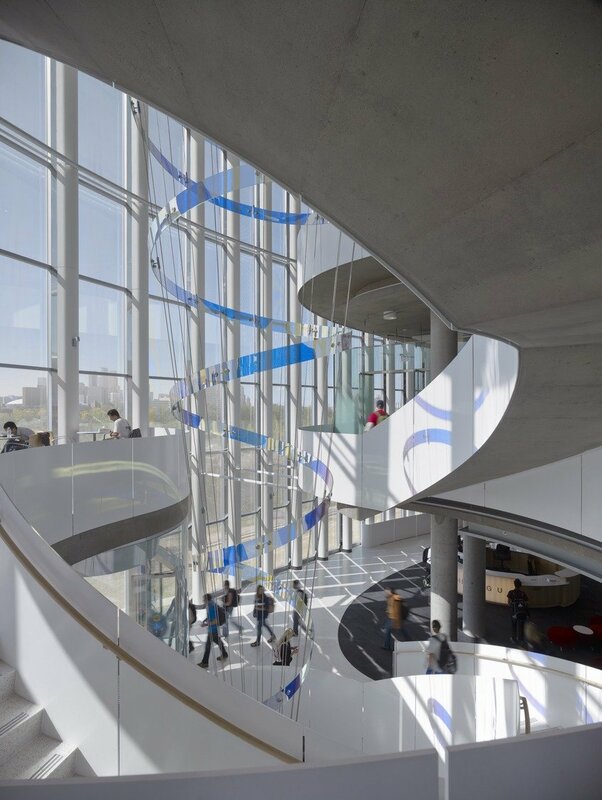 Sustainable features include day-lighting strategies, raised-access floors, displacement ventilation, natural convection, and energy recovery and high-performance glass featuring custom ceramic frit patterns to improve energy efficiency and building performance.